There was a time that we had pizza every Friday night. So much so that when I would make out our weekly menu, Caleb would always say that Tacos are Thursdays and pizza if Friday dinner. For some reason we got away from the pizza night. But pizza is one of Caleb’s favorite things to eat. When I found this recipe I thought to myself, if I tell him it’s pizza, which it really is, he’ll like it. It may look a little different, but it is called “pizza”. This was messy and fun to make. I didn’t have an oven safe pan so I used a glass baking dish instead. I was going to wrap tin foil around the handle, but thought better be safe than sorry! Preparation: Preheat oven as per directions on dough. With a sharp knife, divide each biscuit into 4. In a large bowl, combine diced biscuit dough, sauce, 1 1/2 cups cheese and toppings. Stir to combine. Pour mixture into greased oven safe skillet or 9×13 baking pan. Chiffonade the basil and sprinkle on top along with remaining cheese. Bake according to directions on dough, checking to make sure dough is cooked through and cheese is bubbling (I always bake mine for an additional 5 minutes. Let cool 5 minutes before serving. I think the best part of cooking dinner is that you include the kids with what you’re making. They love to be a part of what they eat. And it makes them feel proud! When this came out of the oven, Brooklyn actually asked why it looked so “bubbly”. Caleb said this sure doesn’t look like pizza, but they both ate it and they both asked for more! I’ve been seeing commercials for this mozzarella cheese that comes in a sheet, and thought that was just waiting for me to get creative. I also have a cherry tomato plant that is going crazy right now, so I wanted to incorporate them as well. These little wraps were fairly easy to make, but my little cheese roll did not unwrap as easily as they show in the commercial! Mix the olive oil, basil and garlic in a small bowl. 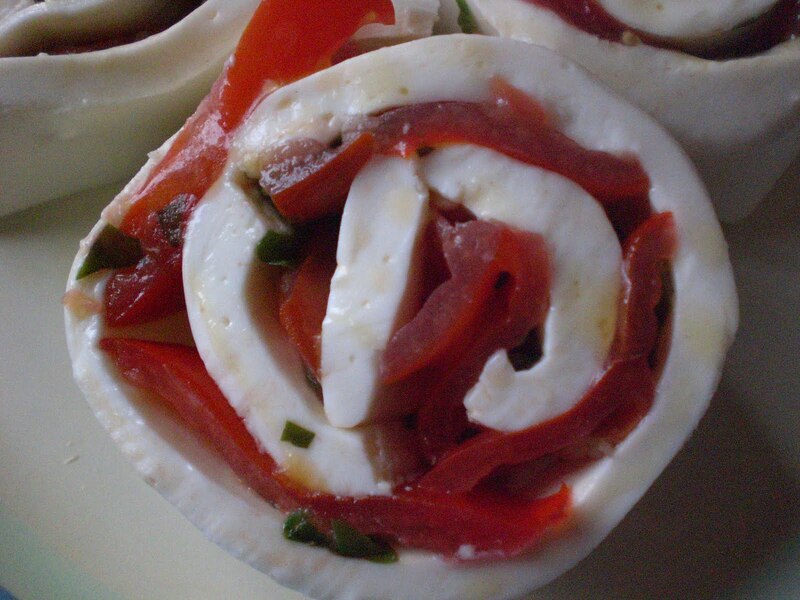 Unroll the mozzarella cheese, spread with oil mixture and top with the sliced tomatoes. Roll the cheese back up, and slice into about 1/2 inch slices. These didn’t want to stay together on their own accord, so I used toothpicks to hold them together until we were ready to eat. They were good, but I didn’t like the texture of this roll cheese as much as regular fresh mozzarella, it felt a little rubbery to me.